Hard to believe, but my little Lily, who's not so little at all, turned 5 two weeks ago! She followed her heart and her true love, and chose to have a penguin party. I was delighted to make her wish come true! Now that she is in JK, we've entered the world of class birthday parties. Luckily, there are only 12 kids in her class, so we were able to invite everyone. With many of their siblings and a few other friends, the total reached close to 20! Thanks to the beautiful weather we were able to celebrate her birthday outside in our backyard. You know I love to bake and decorate sugar cookies and penguins just seemed so easy to do that I couldn't resist. They really were easy, compared to many other designs. I only needed white and black icing and a tiny bit of orange. That alone makes cookie decorating much easier! They turned out really well except for the fact that all the children had super black/purple mouths from all the dye in the black icing! I sewed each of the kids a little penguin mask as the favor. They were simple, made from felt, but cute! My good old rainbow birthday banner hung quite well from the clothes line this year! Lily's request - to have pink lemonade. I added a few berries for looks and taste! There's her favourite penguin stuffties corralled in a basket. Snack tubs filled with penguin crackers and alphabet pretzels. Little Violet, staying close to the food! This was the easiest birthday cake ever to decorate! Two chocolate rounds, slathered with buttercream icing, in the middle, too, of course! Then topped with Lily's favourite penguin toys - Gloria, Mumble and Eric, from Happy Feet Two. It was delicious. I also made a vanilla slab cake, with the same icing and topped with some more penguins. Lily had such a fun day! She was so excited to have all her friends at our house. As soon as everyone left and we cleaned up, Mommy and Daddy finally got to put their feet up and enjoy a cold beer in the lounger in the backyard! I'm excited to share with you some new fabric choices in my Etsy shop! 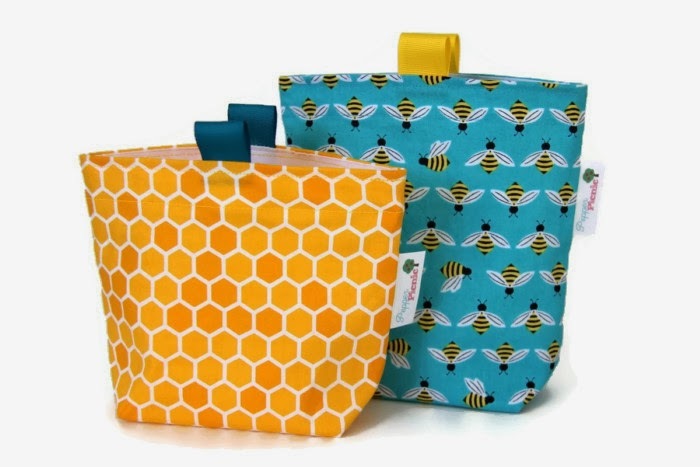 My favourite two of all... these adorable little honeybees on blue, paired with the yellow honeycombs. I just love them! I had to buy both fabrics. 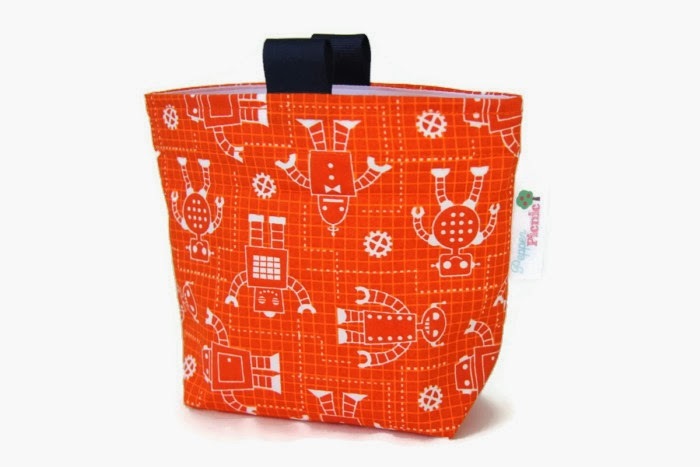 They were the perfect match, and together, they make the perfect snack and sandwich bag set! My friend bought some before Christmas to give to her daughter's teacher and she filled them with locally made beeswax goodies (lip balm, salve and a little beeswax ornament for the tree). It made such a beautiful gift. Robots on burnt orange with navy blue finger tabs. 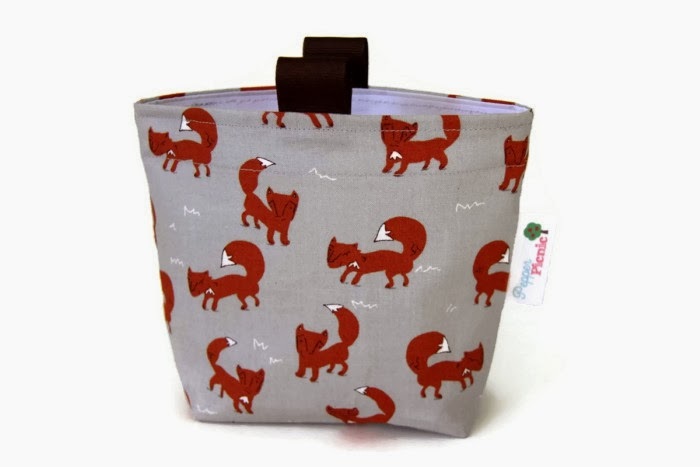 Cute little foxes on gray with brown finger tabs. 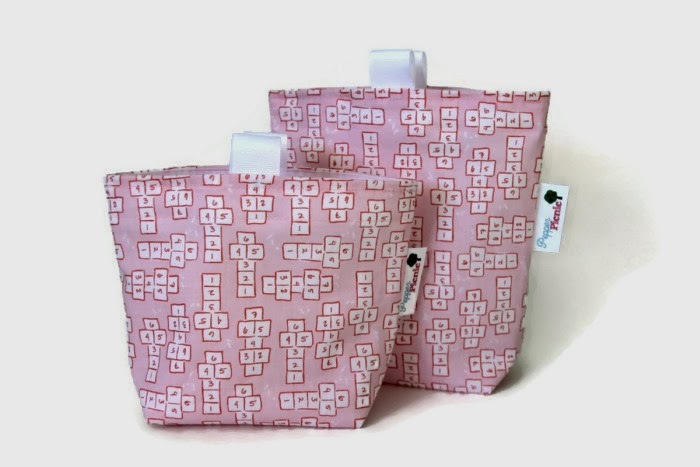 And some pretty soft pink hopscotch ones. These fabrics make me think spring all ready! Maybe it will come sooner than we think? Another Christmas project finished just in the nick of time...stockings for the girls! I'm so glad I got these done. They look beautiful and will last for years and years to come. The girls were truly excited to see them. I hadn't told them about them so it was kind of a surprise for them to wake up to yesterday morning. Little L LOVED the personal touch on hers - penguin fabric (as do I, it's so cute!) and Little V thought the Christmas bunnies and deer, along with Santa's sleigh, on her stocking was "so cute, mommy!" This all makes for a happy mommy! I initially planned on using Thimble Blossoms Merry pattern (I bought the pattern last year), but I ended up using a combination of several stocking patterns that I found online and from a friend. I couldn't decide which quilting block pattern to use so I ended up just cutting my fabric into different sized strips and sewing them together. I like the finished look of it because you get to really appreciate each fabric. Sometimes with those tiny cut squares you aren't able to see how cute the fabric patterns are. I embroidered the girls names with a slip stitch on the cuff before attaching it. The stocking and cuff have a thick batting in them, which makes the stocking super puffy. My husband thought they would make nice warm socks! I hope the batting will help add to their longevity. The girls are in bed now, and I too should go soon, so Santa can come and fill these beautiful stockings tonight while we are all nestled in bed on this lovely Christmas Eve! A couple of weeks ago I took a needle felting class with a friend at Needlework. I had never needle felted before and knew very little about it, so I was excited to attend. I LOVED it! I actually found it addicting and had a hard time stopping! There's something to be said about stabbing a needle repeatedly into some wool. Very therapeutic! We started by learning how to make a penguin, which was absolutely perfect for me, because Little L still loves penguins. I made this adorable little penguin ornament, which will be wrapped and placed under the tree for Christmas morning, for Little L to open. It was surprisingly pretty easy to make, and didn't take much time. Needle felting is such a forgiving craft. If things aren't turning out the way you had hoped, you can easily fine tune it. I also made some little ball ornaments to hang on the tree with the girls initials on them. I hope to make some garland with lots of little colourful felted balls for next Christmas. While at Needlework, I couldn't help myself from buying this adorably sweet bunny fabric! It's designed by Penguin & Fish, a new find for me. Check out her blog, too, for some great craft ideas, including lots of embroidery stuff. I was sold on the name of her business alone! It's finished, and surprisingly, was on time! I actually finished it on December 1st, but that still counts! I LOVE how it turned out. I think it's beautiful! I will boast, yes, because this was a big step for me and I'm very proud of myself for diving in and pulling it all off. I've never quilted before, which brings with it many new skills - making the binding, attaching it, using a walking foot, working with batting, and many more new steps which involve a lot of math, cutting and careful planning. I didn't have a pattern, either, so I was trying to figure it all out as I went along. Thanks to the internet, though, you can pretty much figure out how to do anything! I really enjoyed making it, especially the quilting sections. I'm excited to do another quilted project soon! I'm also really enjoying embroidering these days. I think it looks so beautiful. I thought long and hard about how to put the numbers on this calendar and I just kept coming back to embroidery. I knew it would look the best but I was worried about how long it would take and how tedious it would be. In the end, it wasn't that bad. I stitched the numbers onto some cotton ribbon and then sewed it on top of the pockets before attaching them to the background (linen). One thing I forgot to include in my plans was a way to hang it. This never even occurred to me until I was attaching the last side of the binding by hand. I tried to come up with a last minute attempt but I'm not completely sold on it. I attached 3 looped tabs under the binding to hold a piece of dowel which I then tied some ribbon to. I wasn't happy with the way the ribbon hung and the way it pulled on the calender, so I ended up just hanging it over a nail for now. I'll have to tweak it later. I had fun filling the calendars pockets with little surprises. I tried to do a variety of things - some stickers, stamps, notepads, tiny ornaments, and of course a few chocolates. But I also included some notes with little messages on them. They say fun things like, make a gingerbread house together, make a snow globe, bake Christmas cookies and go see the Santa Claus Parade. The girls really like it a lot and look forward to checking the little pocket each morning. It was a lot of work, but I know this calendar will be around for a long time, while providing my little girls with lasting memories of all the joy that the Christmas season brings. I look forward to pulling it out each December and filling it with special little treats for us all to enjoy together as we count down the days until Christmas.